The first month of a brand new year is the ideal time to make a fresh start. For many people, that means making positive lifestyle changes. Your feet are your body’s foundations, so if you’re determined to develop healthy habits in 2018, it makes sense to start with them. It’s all too easy to overlook your feet, especially in the winter when they spend most of their time in thick socks and boots. However, the importance of examining them on a daily basis (after you’ve showered, for instance) can’t be overestimated. Check for any changes to your skin and toenails, signs of injury, pain or discomfort, and seek help from a foot specialist as soon as you can about anything that worries you. That way, you’re giving yourself the best chance of overcoming foot complaints before they really take hold. Over Christmas, most people’s idea of a workout is reaching for the TV remote. Give your feet a boost in the New Year by resolving to be more active. Why not head outside for a reinvigorating winter walk? When the pavements are free of ice and snow, you could even go jogging or, if you’re fairly fit, running. Stick to a pace you find comfortable, and for a great way to gradually increase your stamina, check out the NHS’s Couch to 5K running plan. Exercise has a crucial role to play in keeping your feet strong and flexible, as well as improving your circulation. It’s bound to make you feel amazing too! As your hosiery covers your feet for hours each day, it can have a significant impact on how healthy they are. Cotton socks are a common choice but can do more harm than good. They rapidly get soggy when your feet sweat, which can lead to chafed skin and also provides the perfect breeding ground for bacteria. Merino wool socks are an excellent alternative, thanks to their ‘wicking’ effect: they draw moisture away from your feet without getting soggy. It’s a good idea to wear woolly tights for the same reason (or silk ones in warm weather). The New Year is also a great time to reassess your shoe collection and get rid of any pairs that are uncomfortable or unsupportive, even if you only wear them occasionally. After all, forcing your feet into poorly designed or ill-fitting footwear does nothing to protect them and increases your risk of foot pain, bunions, blisters, ingrown toenails and many other issues. Rather than guessing your shoe size, it’s sensible to have your feet measured at a specialist shoe shop and invest in properly fitted footwear, preferably with breathable leather uppers and shock-absorbing soles. As a starting point, take a look at the adults’ shoe fitting guide from Clarks – you’ll see just how many different sizes (including half sizes) and widths are available. To ensure that your feet are correctly supported in shoes and can function properly, it’s worth considering custom-made orthotics, moulded to suit the unique contours of each foot. One of the most important steps you can take to improve your foot health is to visit a podiatrist at least every six months, rather like you do with your dentist. During a foot check-up at our hygienic London clinics, our experts can examine the condition of your feet, analyse their function and alignment, check your circulation and perform general foot care treatments. We can also provide a course of more specialised treatment, if required. If you have diabetes, regular diabetic foot assessments (ideally every month) are crucial too, as they help to protect you from problems caused by nerve damage and poor circulation. 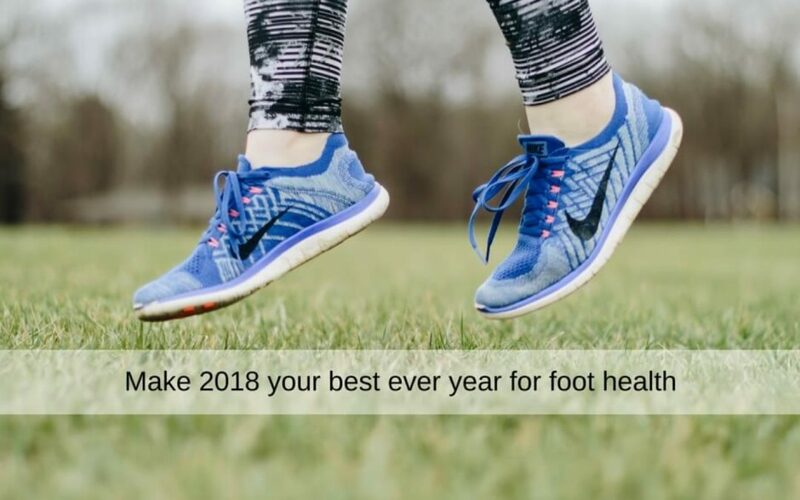 Make 2018 your best ever year for foot health with expert help from Feet By Pody. Simply call us today on 0207 099 6657 or book an appointment online.